Talking Tech | Editor's Note | Kids VT - small people, big ideas! Kids VT readers often approach me with story ideas for this magazine. More often than not, the suggested topics relate to parenting and technology. The rapid pace of technological change is something we're all grappling with. Do we introduce our kids to the latest techie tools? If so, when and how? If not, will they miss out? And how do we teach them to act responsibly when using their digital devices? We can't answer all of your technology-related questions in this month's Technology Issue of Kids VT, but we've rounded up a handful of stories addressing this new frontier. In "Go Ask Dad," Thea Lewis asks local pops to ponder the right time to give kids a cellphone. The answer? Depends on the dad — and the kid. In "The Art Of," Alison Novak visits a Middlebury filmmaking class where kids make their own movies using digital cameras and editing software. In "Tablet Time," writer Charles Eichacker visits a Hinesburg school that gives iPads to its students. He talks with education experts about the benefits and drawbacks of putting these devices in students' hands. Megan James profiles two "media-cautious" Charlotte parents who have become unlikely internet entrepreneurs. Their startup, Sparkle Stories, is now one of the top-rated children's podcasts on iTunes. Finally, in this month's "Use Your Words" essay, Melinda Moulton explains how her autistic grandson is using his iPad to communicate with his family for the first time. We publish this issue in October because it coincides with the annual Vermont Tech Jam, a free job fair and tech expo organized by Kids VT's parent company, Seven Days. It's a great opportunity to introduce kids to productive uses for technology. 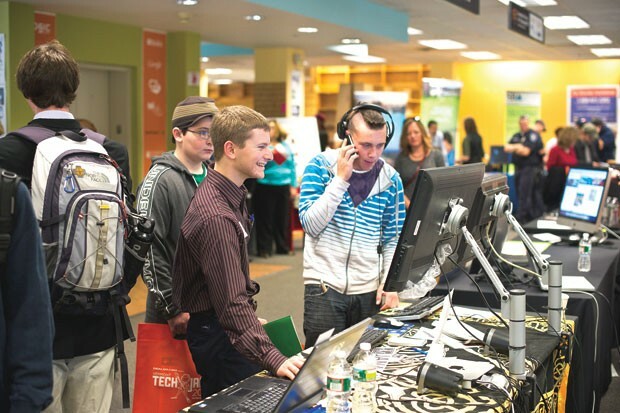 Hundreds of middle and high school students attend every year to learn about tech careers and local college programs that prepare students for those jobs. The 2013 Tech Jam is on Friday and Saturday, October 18 and 19, at Memorial Auditorium in downtown Burlington. This year, the program includes sessions on video game design and robotics. On Saturday, kids can meet one of the world's most advanced androids, Bina48. There's even a series of hourlong workshop in which participants can learn to build computers. For more information, visit techjamvt.com. And if you have other stories to suggest, technology-related or not, send them our way. We always enjoy hearing from you.